The anxiety on the eve of your feature film’s release is pretty similar to giving birth to a child! In fact a little more I would say because if the child is mischievous or has any problem, you have a lot of time for course correction but with a film it’s pretty much become like a do-or-die over the opening weekend. Gone are the days when you would release a film and in case it didn’t do well on the Friday-Saturday, you could give it some time and expect it picks up by word of mouth. In fact Bollywood folklore has it that India’s most famous film ‘Sholay’ was a disaster when it released and was on the verge of being pulled out of theatres but subsequent word of mouth and the support of theatre exhibitors gave it that extra rope for a few more days. The rest as they say is history! Even the legendary Meena Kumari starrer ‘Pakeezah’ was a flop when it initially released but her untimely death and a sudden sympathy wave resurrected it in its 10th week to make it the iconic hit that it became. Even till a few years, you had films which didn’t have huge P&A budgets but pulled through thanks to word of mouth after a dull initial opening. Cult films like Roja, Chandni Bar and even the Sanjay Kapoor starrer ‘Sirf Tum’ are glaring examples of what we used to call a sleeper hit. But as I said, those were the days when films were allowed to grow on the audiences and distributors supported films to hang around for a little longer. The pace of life has changed drastically in the last 5 years and so has the pace of business. With everyone in a hurry to do things, it’s only but natural that cinema is also in a hurry. Everyone wants to make at least a couple of crores in the first weekend, everyone wants to release their films in maximum number of screens across the country, everyone wants all the prime time shows even if it means cannibalizing and driving out all the other films releasing on the same Friday. And adding pace to this frenzy are the exhibitors who are also in a hurry to measure which film makes how much money on Day 1 itself. Which means suppose your film is releasing with 5 other films, which is the norm nowadays, and your P&A is not that strong then only God or star power can save your film from being pulled out of the theatres by Monday. So what happens if you don’t have a star in your film? Well, then you either pay extra and use your muscle to get decent shows. As a filmmaker rightly said, making a film is the easier thing today. Releasing it well is the tough job. So for me, coming from a short film background which had a template that I knew like the back of my hand, a feature film was an entirely different world and it took me a while to understand that it is much more than just a creative animal. When you do a short film, the stakes are relatively lower and so is the game but in a feature film, there are multiple factors and stake holders involved at every level. And the quicker you adapt to the change, the better it is. But one thing I must state that a film is a film irrespective of the duration. Having also produced short films actively under the SHAMIANA banner, the process right from the adrenaline rush to excitement on the sets to the camaraderie, there’s not much difference. But then it’s still my first film so I could be wrong! The only difference is of course that the stakes are different so the amount of money you spend on a feature is manifold than what you’d spend on a short. Fortunately I had a wonderful team of people including my co-producers – Dhaval Patel, Sada Bhuvad and Tariq Mohd and our Director Hasnain Hyderabadwala who comes with lots of experience. It’s been a very memorable experience, almost magical. And as Francis Coppola rightly said ‘I think cinema, movies, and magic have always been closely associated. The very earliest people who made film were magicians.’ However involved you are in a film as I have been, what you seen on the screen is nothing short of magic! 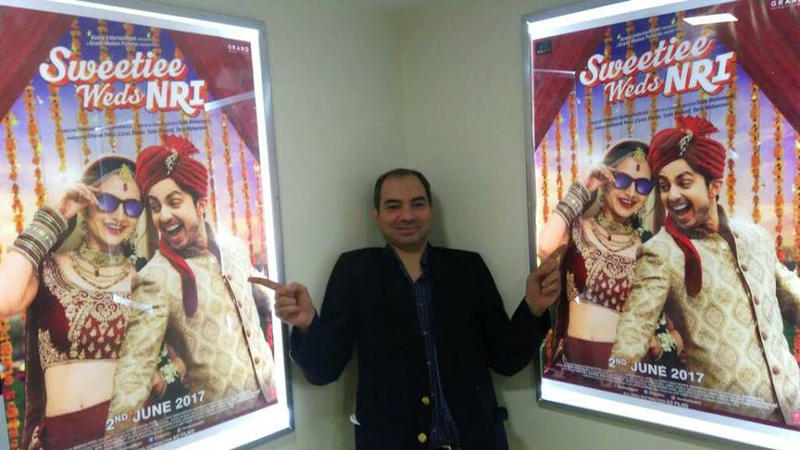 P.S-The author is the founder of Shamiana, the popular short film club and he now turns feature film producer with “Sweetiee Weds NRI” that’s due for release on 2nd June,2017. We at MAM wish Cyrus all the very best for the release of the film. Lights, Camera …. SHAMIANA !